TeamMate Analytics is an Excel-based internal audit data analytics solution that enables auditors to perform advance data analysis and reduce risk. Instead of auditing a small sample, auditors can analyze all the population without being inefficient. This also helps highlight any potential issue that otherwise might be hidden deep in the population sample. The software provides auditors with all the tools they need to get to the root of issues. It makes it easier for them to calculate and communicate the value that can be delivered by a proposed investment, providing an incentive to act. 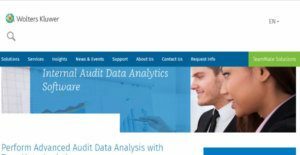 The software makes it easier for users to get familiar with data analytics tools and enables auditors to do analytics when needed, without solely relying on ‘the data guys’. TeamMate Analytics makes it easier for auditors to perform analytics along with regular audits. Designed to be a powerful tool of every auditor’s arsenal, the software saves them from having to write scripts and connect to databases. This allows auditors to spend more time on focusing on their core responsibilities instead of worrying about the IT stuff as the software used auditor-friendly and familiar terminologies. Since the software does not require auditors to be familiar with scripting, everything is point-and-click and tools guides them through the information they need to enter. Each input is validated with easy to understand and simple color codes i.e. red, orange and green, which are easy to interpret and guide the users through. TeamMate Analytics is based on the familiar and widely used Microsoft Excel, making it a comprehensive data analytics package that comes with all audit analytics capabilities. What differentiates TMA from most other audit analytics software is its user friendliness. All users need to do to identify duplicate transactions is to open the Excel spreadsheet and chose duplicated from the all-familiar ribbon. The software also supports advanced analytics without making life difficult for auditors through easy-to-use tools. In addition to powerful features, TeamMate Analytics also helps users discover when to perform analytics, making it a suitable solution for internal and external auditors, finance managers, fraud examiners and accountants. If you are interested in TeamMate Analytics it could also be sensible to check out other subcategories of Best Data Visualization Software gathered in our base of SaaS software reviews. Since each enterprise has unique business needs, it is advisable for them to desist from looking for a one-size-fits-all faultless software system. Needless to say, it would be useless to try to find such an app even among market-leading software platforms. The intelligent thing to do would be to jot down the various vital aspects that need consideration such as main features, finances, skill levels of workers, company size etc. Then, you should do your homework thoroughly. Read some TeamMate Analytics reviews and look into each of the other solutions in your shortlist in detail. Such in-depth groundwork can make certain you reject ill-fitting platforms and zero in on the app that presents all the features you need for business success. How Much Does TeamMate Analytics Cost? Enterprise and SMB pricing information is available by quote. We realize that when you make a decision to buy Data Visualization Software it’s important not only to see how experts evaluate it in their reviews, but also to find out if the real people and companies that buy it are actually satisfied with the product. That’s why we’ve created our behavior-based Customer Satisfaction Algorithm™ that gathers customer reviews, comments and TeamMate Analytics reviews across a wide range of social media sites. The data is then presented in an easy to digest form showing how many people had positive and negative experience with TeamMate Analytics. With that information at hand you should be equipped to make an informed buying decision that you won’t regret. What are TeamMate Analytics pricing details? What integrations are available for TeamMate Analytics? TeamMate Analytics works with Microsoft Excel. More information about integration with other enterprise systems and apps can be obtained from the official support. If you need more information about TeamMate Analytics or you simply have a question let us know what you need and we’ll forward your request directly to the vendor.